Send push notifications to your apps which will appear on users devices whether the app is active or not, great for drawing users back into your apps. 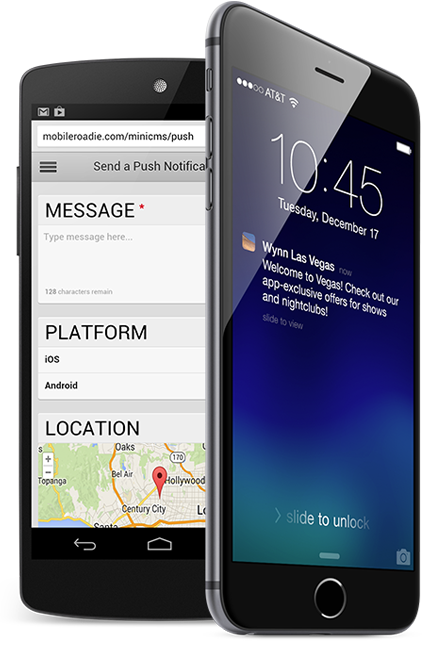 Set a 128 character text message for the push notification, and choose which platforms it will be delivered to. If Pro, schedule the push for later, target a specific location, and link the message to in-app or web content. You'll see the number of users the message will reach. If Pro, see stats on the push notifications you've sent, how many were received and how many app visits it resulted in. Enable badges in your app to reward your users who are participating and using the app. Choose from our pre-created badge themes. Pro accounts get more badge theme options to choose from. Set up badges for these types of action, with the number of required actions that you define: listening to audio tracks, commenting on content and in the Fan Wall, sharing content to Facebook or Twitter, liking content, launching the app, watching videos, checking in to locations, and viewing photos. Add a line of code to your main website; when users visit your site, they're be prompted once to download your app for the device they're on, or visit your mobile web app (pro only). We generate an app gallery web page on our site to represent and promote your app and encourage downloads. Create golden ticket campaigns to reward your app users and run contests. For each campaign, set a start and end date, number of tickets to distribute, reward message, image, and resulting link. Tickets are randomly distributed based on number and dates. They're triggered from either home screen visits, or from sharing content. When a user receives a golden ticket, they're encouraged to enter their email address. When the campaign is over, we'll email you the list of winners. See useful graphs on golden tickets in Analytics. Audio, Video, and Photo content can be locked so users get a teaser, but have to perform an action to unlock it. Locking to QR code requires the user to scan a QR code to unlock your exclusive content. Locking to social share requires the user to share the app to their social networks to gain access to your content. Locking to email address requires the user to provide you with their email address in order to view the content. Promote almost anything in your app with a popup promo campaign. The popup promo is triggered the next time a user launches the app. See stats on previously sent popup promos, how many were received and how many were tapped on. Scanning these QR codes within the app with the QR Scanner will jump straight to that content. Photos, Video, and Audio can also be locked so the QR code must be scanned in order to unlock and view the content. Like what you see? Our Client Services team is standing by. Start Now. Curious to see more of what Mobile Roadie can do for you? Do you still have questions? We are here to help.